Innovation is the hope that businesses look towards to fuel competitive advantage. Some businesses are focussed on achieving the next big breakthrough, others on smaller more incremental enhancements to their products and services. Both are important, but an often overlooked but critical aspect of innovation is the incremental and continuous change that is required across all parts of a business in order to better enable it. Re-thinking the way we work and the way products are developed in order to deliver more value, given the inevitable constraints. BT Financial Group is Westpac’s wealth management business, but our product development teams are structured in a way that better enables us to operate like a smaller, more agile business. On Panorama, BT’s wealth transformation program, we have around twenty teams of 10 – 15 people in place, each focussed around a particular business domain or customer need and led by a product owner (product development lead). Product owners are at the core of innovation process at BT and are seen to be critical enablers of our customer and business success. 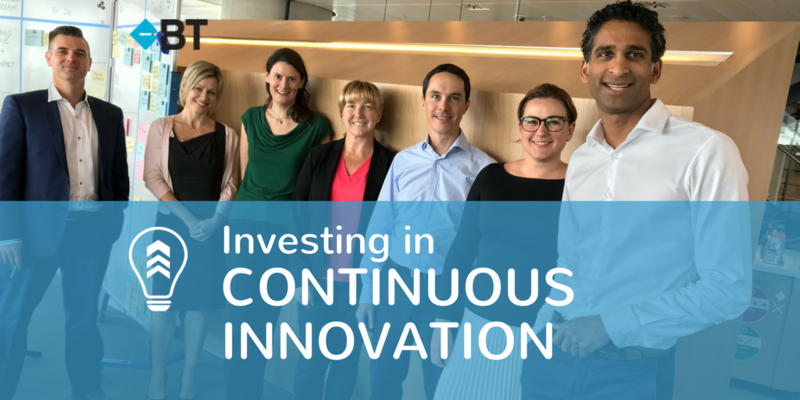 They are experts in their respective areas, have a backlog of ideas on what is to be done next and there is an operating and funding rhythm around them to support continuous improvement. We empower our product owners to make decisions with their cross functional teams which leads to an increase in the speed and quality of decisions. Decisions are informed by a cross functional view which takes into account product, design, technology, risk and operational views in the teams and direct customer insight. This process breaks down silos, increases speed to market and better enables innovation and is only possible because our culture of innovation began at the executive level. “Innovation is not something you can run centrally within a large, established business. The way we drive innovation here at BT is through the specific business units and then tooling up teams of people with the skills, time and the capacity to think through better ways of doing things.” John Shuttleworth, General Manager, Platforms & Investments, BT Financial Group. In conjunction with user experience designers, our product owners conduct customer research to ensure that our customers’ needs are continually being met and their experience continuously improved. We place the customer at the centre of our product development process at BT through a process of design thinking. Looking in: immerse in the topic using everything we know internally on the topic and domain – research, internal experts and listening to customer calls in the contact centre. Then, we ensure the problem has been correctly framed. Looking out: conduct customer research, observe other industries, or competitors in the same industry to see how they have approached a similar problem from different angles. Ideation: distil all of the gathered knowledge into structured insights and start forming hypothesis. Prototyping: quickly get into testing so there is something immersive to evaluate and share. We approach this step iteratively. It is so important to get to this stage quickly, so there is a tangible basis for gathering feedback from our customers. Alongside design thinking, there is a strong focus on agile and lean product development processes at BT. We have reviewed how other successful businesses have adopted agile methodologies and have had numerous experts on the topic come into the business to educate and guide our teams. While our product development processes are agile, the longer term goals and design of the end state wealth management platform have also been front of mind with Panorama. We focus on forming a ‘breadth first view’ and higher level business and solution design upfront which supports our longer term goals and broader strategy. We then develop product backlogs which break the problem down into more manageable parts which are prioritised and worked on based on relative business and customer value. This collaboration of agile teams consisting of product owners, designers and technology developers and the application of a customer-centred design approach has enabled us to innovate at scale and resulted in the development of BT Panorama. BT Panorama is an intuitive and intelligent wealth operating system which uses the latest design methodology to enable a simple and easy user experience in Investments and Superannuation. BT Panorama is now at the forefront of the wealth management industry in regard to both our wealth management solutions and our product development disciplines. BT Financial Services is a sponsor of the 2017 Leading the Product conference series. Come along to the Sydney event and meet Anil and team. They will be there learning from others in the Product Management industry and sharing experiences during the day. In Melbourne? Unfortunately, tickets have sold out for Leading the Product Melbourne. But there are still some available for Leading the Product Sydney, if you are quick. Click here to review and book.